All the good stuff is right here! At the first of the year my husband, Mom and I decided that together we would walk or run 2016 miles in 2016 – how’s that for a challenge?!! Although that sounds like a big number when you break it down between three people, it’s really quite do-able. My 74 year old Mom contributes about 9 miles every week – my hubby and I put in about 18-20 each. By my calculations, given a sick day and vacation here & there – we should achieve this goal by October or so. But you know I figure if my 74 year old Mom can do it….I certainly can put in my share! It’s fun to do together because we report our miles at the end of the week and it encourages you to put in a few more miles each week because we are all depending on each other. Having said that, it is a big commitment – consistency is the key and now that we are in May it makes it even a bit more challenging. For me consistency comes in several ways, whether that is the amount of exercise I get daily or beginning my day with the right fuel for my body. For me, grab-n-go food just doesn’t work. I need protein and that’s why I enjoy grabbing a quick smoothie to start my day or after a work out. I have a great smoothie to share with you that includes Jif Creamy Peanut Butter which I love because it offers the protein I need – 7 grams in each servings! 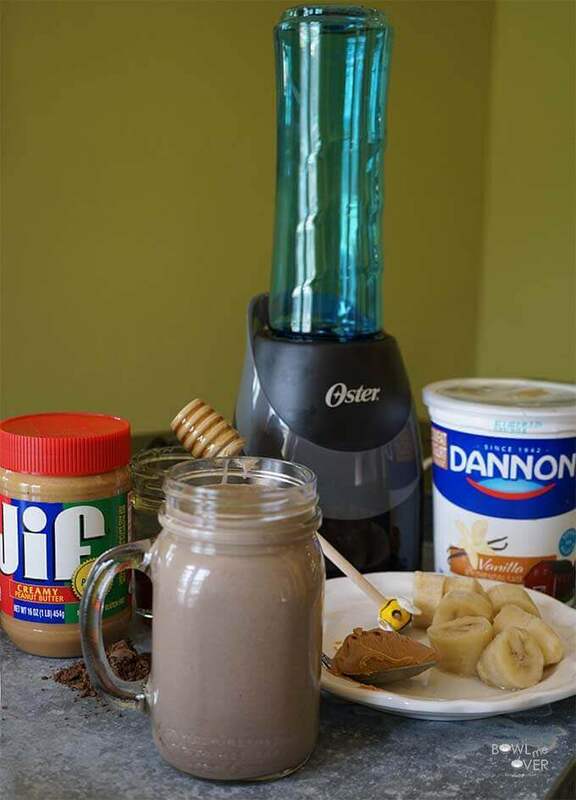 Dannon Vanilla Lowfat Yogurt – so delicious made with only natural ingredients (I actually use yogurt quite often in salad dressings), a frozen banana, honey and cocoa powder – into the Oster® Blend-N-Go® MyBlend® – such a great blender for making smoothies – you can just fill, blend & go! I found everything I needed at my local Walmart. Now let’s get back to this amazing smoothie. Simple, delicious and a great way to start your day – my hubby even enjoys this as a sweet treat! I like it because it’s healthy, delicious, filling and super easy! Love an easy breakfast? Here are a few more tasty recipes! 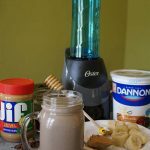 Peanut Butter Banana Chocolate Smoothie - Simple, delicious and a great way to start your day - it's healthy, delicious, filling and super easy! Combine all of the ingredients in your blender - blend until desired consistency. Serve immediately. What’s your favorite go-to Smoothie? Peanut Butter is always a winner! This looks delicious! Yum, yum, yum – thanks Florian! Peanut butter and banana.. You are winner to match them together! Thank you Citra – I hope you give this yummy smoothie a try! My husband loves smoothies! 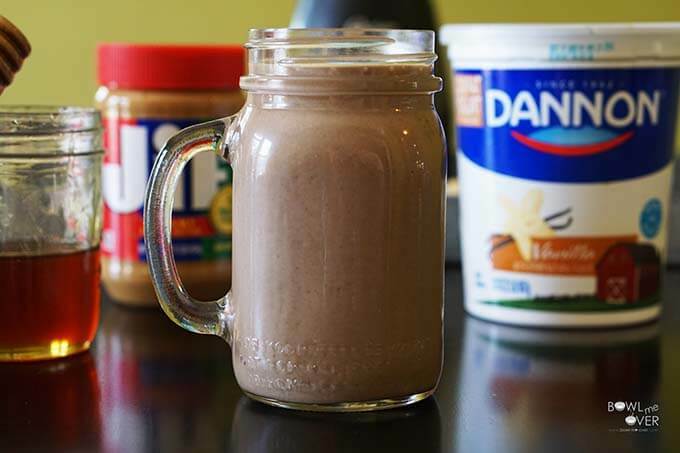 This is a perfect breakfast smoothie for him to take to work with him! You know that’s a good point – it’s great to go, super easy when you use the Oester blender too, but I also used a mason jar – worked great also! I am so impressed with your commitment for 2016 and this simply delicious smoothie recipe. You make me want to eat chocolate, peanut butter and run like hell! Oh my this looks and sounds fabulous! I can’t wait to make it for breakfast! This is so creamy, filling and delicious – enjoy!! 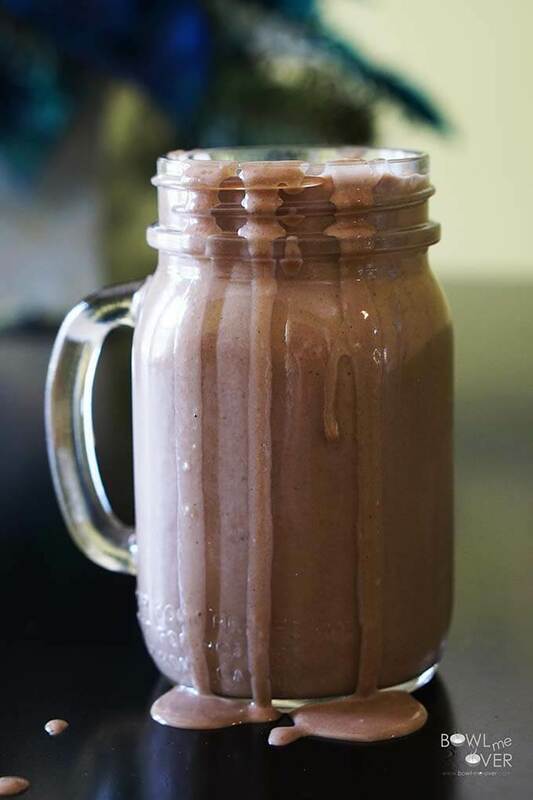 This Peanut Butter Banana Chocolate Smoothie looks super delicious! My kids would love it! Pinning and stumbling for later! Those are three of my favorite flavors for smoothies! This sounds like a fabulous Smoothie recipe! Looking forward to trying it, Pinned 🙂 Thanks so much for sharing it at the Sunday Fitness & Food Link-Up!! You bet Angela! I always enjo your party! I LOVE all things peanut butter and banana. But then you threw in chocolate and totally won me over. So yummy Anna, I hope you do! What a fabulous family goal – and I love that your mom is participating too! Love your delicious smoothie – you’ve got some of my favourite flavours in there! Thanks April, we’re having fun working together! And the smoothie…outa this world yummy!! Chocolate, peanut butter, banana – what’s not to love? Thanks so much for sharing with the Let’s Get Real party. We are huge consumers of peanut butter in our home. I like putting it in some Thai food occassionally. It always turns out great. Your Smoothie recipe looks so delicious.